Hi Everyone! 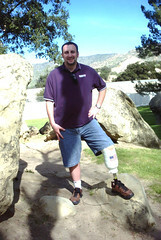 I have been getting a lot of email from folks interested in knowing how I am progressing with my prosthetic leg. This picture was taken 2-5-05, the day after I received the prosthetic. The device pictured above consists of a liner that rolls (condom style) on to my leg (provided by Ossur) and attaches to the "bucket" or sleeve (designed by O&P In Motion) and ends in a light-weight pylon attached to an "ankle" that bends with each step (Otto Bock). Finally a prosthetic foot with a separated big-toe for ease of motion. The American Flag sticker has the caption "United We Stand". It seemed appropriate! And YES I do experience "phantom Pain". It comes in the form of sharp nerve pains. Instead of feeling it in my "stump", it feels like it is in part of my foot which is of course impossible because I have no foot there. It is sometimes a real mind-tweak but I am getting used to it. As NewsMax.com reports today, President Bush's approval ratings have jumped since he won re-election. At the time of the election, his approval rating (according to a Gallup poll) was 48%. According to a new CNN/USA Today/Gallup Poll president Bush's approval rating is at 57% and appears to still be climbing. Other polling data indicates that a clear majority of Americans now feel Bush's decision to invade Iraq was correct. According to USA Today, "majorities now say that going to war in Iraq was not a mistake, that things are going well there and that it's likely democracy will be established in Iraq." Republican legislators in general are doing well too. The same Gallup poll found Republicans with a 56 percent approval rating, compared to just 46 percent for rival Democrats. And in a blow to Democrats, Howard Dean, the likely new head of the Democratic National Committee, only received a 31 percent approval rating.